Avant-garde anything, be it music, art, or film, is arguably the most divisive form of entertainment that we�ve ever known. On the filmmaking front, even the most heralded of avant-garde masters are rendered obscure by a general public who has either never heard of them or never taken the time to seek out something different from the mainstream. While I�m not sure that it really changed this sad state of challenging cinematic affairs, The Criterion Collection�s release of their exquisite compilation of Stan Brakhage films titled By Brakhage: An Anthology made strides towards opening more eyes to avant-garde filmmaking. 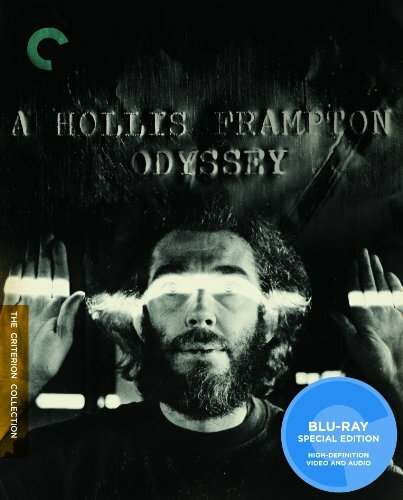 Fortunately, Criterion is at it again, this time taking the essential works of Hollis Frampton and putting them on A Hollis Frampton Odyssey, a Blu-ray release that is sure to make many Home Video reviewers� 10-Best lists at the end of the year. A Hollis Frampton Odyssey begins with six of his �Early Films�: Manual of Arms, Process Red, Maxwell�s Demon, Surface Tension, Carrots & Peas, and Lemon. The first, 1966�s Manual of Arms, is 18 minutes of nothing but faces belonging to Frampton�s friends. This is followed up by the four-minute piece Process Red, also from 1966, and focusing, this time on human hands. 1968�s Maxwell�s Demon takes a close-up look at man�s movements, while Surface Tension (again from 1968) is a multi-part piece about a man�s plans to make a film, followed by a fast journey through New York City streets. Carrots & Peas, from 1969, takes a humorous look at seemingly normal aspects of human life, and the last of these films, �69�s Lemon, was done in one shot and is a pretty incredible look at a seemingly banal fruit. The highlight of the collection is also Frampton�s most famous work, 1970�s Zorns Lemma. Running for just under 60 minutes, this has the distinction of being the first feature-length avant-garde work to ever be screened at the New York Film Festival. It�s broken into three parts, with the first, short sequence consisting of a woman�s voice reciting fun, little rhyming phrases against an all-black screen. We�re then given the lengthiest part of the film, consisting of numerous, seemingly, yet never random shots of street names, advertising signs, etc that are tied to a theory by mathematician Max Zorn in 1935. Despite the relative popularity of this film, the images� ties to Zorn�s theory are often difficult to pinpoint, and the film on the whole is extremely confusing, making it Exhibit A for why many people shy away from such pieces. Still, these are the same qualities that make it an essential addition to A Hollis Frampton Odyssey and a polarizing experience. Next, we find the first three films of Frampton�s seven-film Hapax Legomena (which translates to �things said one time�) cycle, (nostalgia), Poetic Justice, and Critical Mass. It�s been said that Frampton thinks of the films in the Hapax Legomena cycle (the other four, Travelling Matte, Ordinary Matter, Remote Control, and Special Effects, are, sadly, missing from this collection) as both interrelated and �detachable parts.� Regardless, the three that we have here are excellent and do a much better, more concise job conveying the genius of Hollis Frampton, than the muddled Zorns Lemma does. The final group of films is Frampton�s �Films From Magellan,� an unfinished cycle that he began working on in 1972, and continued to make until his death in 1984. The intention behind the Magellan cycle was to, when finished, have 36 hours of film that would be shown over a 371-day span, which he called the Magellan Calendar. These films are broken down by the three phases of the calendar: �The Birth of Magellan,� �Straits of Magellan,� and �The Death of Magellan,� and they include a total of 14 short films. The first, Day OXX = 30 DEC: The Birth of Magellan: Cadenza I, is a mixture of wedding footage and parts of the 1902 movie, A Little Piece of String. �Straits of Magellan� is a group of one-minute �Pans� that certainly conform to the running theme of repetition that is a cornerstone of Frampton�s work. Finally, �The Death of Magellan� brings appropriate closure to �Films From Magellan� and is also the first movie in which Frampton used a computer. The Blu-ray disc, itself is another crowning achievement for The Criterion Collection, as all of these short films sport new, high-definition digital transfers that were crafted using original 16mm source material. While specific video quality varies from film to film, this is, overall, some of the best 16mm stuff that Criterion has ever put its awesome hands on. The English LPCM 1.0 audio is the product of extensive remastering of the original mono soundtracks at 24-bit. Still, the quality varies throughout, but there is a surprising amount of depth here, and an amazing lack of distortion, noise, and other defects. The supplements include a 21-minute interview with Hollis Frampton that was conducted at the School of the Art Institute of Chicago in 1978 by filmmaker Adele Friedman. During the discussion, Frampton gives us quite a bit of background about his life and how he fell in love with art. A Lecture is the audio portion of one of Frampton�s performance pieces that was recorded on October 30, 1968 at Hunter College in New York City. In it, we hear the voice of artist Michael Snow, along with a collection of images similar to those that Frampton actually used during the live performance. Lastly, we get, By Any Other Name, a gallery of Frampton�s artwork that stems from his 70- piece xerographic series consisting of photocopies of unaltered product labels. This is an extremely interesting take on something so simple that we usually take for granted�it�s refreshing to see it presented as art in a way that many of us would never imagine.